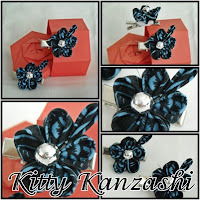 What kanzashi shall I show you now! How about this pair of tsumami kanzashi flower hairclips made from a navy-blue coloured cotton fabric? * Colour - navy blue with blue streaks. Once the pursuit of the royal maidservants, "tsumami kanzashi" or "pinching hair accessories" have long been worn for centuries by Japanese women to decorate their ornament hairstyles. Nowadays they are mainly worn on special occasions or by artists called maiko and geiko. Each petal is made from one square of fabric carefully folded using tweezers and then delicately arranged onto a base to create the flower of choice. Precision is key with this tsumami technique and many hours of practice (and patience) is required to be able to produce these flowers. Howwever once mastered, this technique offers the artisan the freedom to create unique flowers which are as charming as the real object which will never wither away.